Elvis sightings are reported sightings of singer Elvis Presley following his death in 1977. The conspiracy theory that Presley did not die and instead went into hiding was popularized by Gail Brewer-Giorgio and other authors. ✪ LISA-MARIE and ELVIS PRESLEY, SPECIAL DUETS ! The earliest known alleged sighting was at the Memphis International Airport where a man resembling Presley gave the name "Jon Burrows", which was the same name Presley used when booking hotels. A series of alleged sightings took place in Kalamazoo, Michigan, in the late 1980s. Such reports encountered much public ridicule and became fodder for humorous publications like the Weekly World News. In California, many people believed to have seen Presley at California's Lego Land amusement park shortly after opening in 1999. It was later revealed that Elvis impersonators were hired as an attraction to commemorate the famous singer. Presley was rumored to have appeared in the background of an airport scene in the 1990 film Home Alone. It was alleged that a bearded man wearing a turtleneck and a sports jacket could be seen over the left shoulder of Catherine O'Hara's character while she is arguing with an airline employee. Paranormal researcher Ben Radford responded to Elvis sighting believers with "Why fake your death and then turn up as an extra in a popular movie? How could the cast and crew have failed to notice the presence of one of the most famous figures in the world? Even if he looked very different could he have disguised his voice and mannerisms?". Radford was challenged to find the actor who played that part to prove it was not Presley. He explained that the burden of proof was on the person making the claim. In an interview with USA Today, director Chris Columbus responded "If Elvis was on the set, I would have known". After being challenged by Radford to locate the true identity of this extra, Kenny Biddle investigated and found the man to be Gary Richard Grott, who died of a heart attack in February 2016. Biddle located Grott's son, Roman, who explained that his father was indeed the extra in the airport scene of Home Alone, and that he had known director Chris Columbus personally. Because of this he appeared in a number of his movies as an extra, including Home Alone. Bill Bixby, who co-starred with Presley in Clambake and Speedway, hosted two television specials investigating the conspiracy: The Elvis Files (1991) and The Elvis Conspiracy (1992). The conspiracy was also featured in the 1990 video game, Les Manley in: Search for the King, where the titular hero attempts to find Presley (known in the game as "the King") to win a million-dollar contest. ^ Partridge, Kenneth (August 14, 2017). 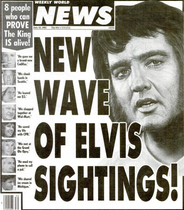 "Suspicious Minds: The Bizarre, 40-Year History of Elvis Presley Sightings". Retrieved January 6, 2018. ^ Schmidt, William E. (October 17, 1988). "Vicksburg Journal; Someplace for the King to Call Home". The New York Times. Retrieved January 6, 2018. ^ "@the Buxton Library". ky5ry5jk2j.search.serialssolutions.com. Retrieved 2019-02-12. ^ Radford, Ben (2018). "Is Elvis Presley in Home Alone?". Skeptical Inquirer. Committee for Skeptical Inquiry. 42 (1): 26–27. ^ Alexander, Bryan (October 5, 2015). "'Home Alone': Still a scream 25 years later". USA Today. Retrieved December 12, 2016. ^ Biddle, Kenny. "Busting the 'Elvis Presley in Home Alone' Movie Myth". csicop.org. CFI. Archived from the original on October 25, 2018. Retrieved October 25, 2018. ^ "When Nixon Met Elvis". www.archives.gov. Retrieved 2019-02-15. ^ Kogan, Rick (August 13, 1991). "The Once And Future King". Chicago Tribune. Retrieved January 6, 2018. ^ Kogan, Rick (January 22, 1992). "`Anything But Love` Axed By Studio And Abc". Evening: Best on TV. Retrieved January 6, 2018. ^ Cobbett, Richard (December 24, 2010). "Crap Shoot: Les Manley: Search For THE KING". PC Gamer. Retrieved January 14, 2018.